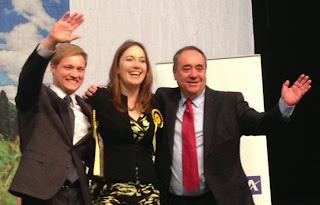 Banff & Buchan MP Eilidh Whiteford secured the biggest-ever vote in the history of the constituency since its creation at Thursday’s election. The SNP candidate polled 27,487 votes, a massive 60.2% of the poll. This surpasses even Alex Salmond’s result in 1997 when he achieved what was then the record of 55.8% of the vote. In fact, you have to go back to the General Election of 1931 in the former constituency of East Aberdeenshire to find a larger percentage share of the vote for any candidate. “I am humbled by the overwhelming vote of confidence that I have received from the people of Banff & Buchan. “The results from across Scotland show very clearly that people want Westminster to listen more carefully to their priorities - ending austerity, keeping the NHS public, and delivering substantial more powers for Scotland.